511. position; The Gynoecium occupies the center of the flower at the termination of the axis. It consists regularly of a circle of distinct pistils, (§ 405), symmetrical in number with the other circles. It is subject to great variation. The pistil may be distinct and simple, as in columbine, or coherent in various degrees into a compound body, as in St. John's wort. Pistils. 872, Symphytum, basilar style, ovary 4-parted. 371, ♀ Fl. of Emblica (Euphorbia-ceae), branching styles. 373, Mirabilis Jalapa, globular stig. 377, Fl. of Luzula, stigmas linear. 374, Feathery stigmas of a grass. 379, Stigmas of Aster. 375, Rumex. 376, Poppy. 378, Filiform stigma of Zea Mays, (Corn). 512. Exception. Also instead of being free and superior, as it regularly should be, it may adhere to the other circles, as already explained (§ 462), and become inferior, that is, apparently placed below the flower, as in the currant. 513. The number of the pistils is by no means confined to the radical of the flower. They may be increased by multiples, becoming a spiral on a lengthened receptacle, as in tulip-tree, or still remaining a circle, as in poppy. On the other hand they may be reduced in number often to one, as in cherry, pea. Certain terms are employed to denote the number of pistils in the flower, such as monogynous, with one pistil, trigynous, with three, polygynous, with many, etc. 514. The simple pistil may usually be known from the compound, by its one-sided forms - having two sides similar and two dissimilar. If. the pistils appear distinct, they are all simple, never being united into more than one set, as the stamens often are. 516. The morphology of the pistil. As before stated, (§ 380), the pistil consists of a modified leaf called a carpel (ĸaρπoς, fruit), or carpel-lary leaf. This leaf is folded together (induplicate) toward the axis, so that the upper surface becomes the inner, while the lower becomes the outer surface of the ovary. By this arrangement two sutures or seams will be formed, the dorsal, at the back by the midvein, the ventral, in front by the joined margins of the leaf. 885, Simple pistil of Strawberry, the stylo lateral. 3SG, Simple pistil of Crowfoot, cut to show the ovule. 330, Simple pistil of the Cherry. 3S1, Vertical section showing the ovule (o), style (8), stigma (a). 882, Cross-section of the" same. 384, Compound pistil of Spring-beauty. 383, Cross-section of the same showing the 3 cells of the ovary. 378, Expanded carpellary leaf of the double cherry. 379, The same partly folded as if to form a pistil. 517. Illustration. This view of the pistil is remarkably confirmed and illustrated by the flowers of the double cherry, where the pistil may be seen in every degree of transition, reverting toward the form of a leaf. This carpellary leaf stands in the place of the pistil, having the edges infolded toward each other, the midvein prolonged and dilated at the apex. 518. 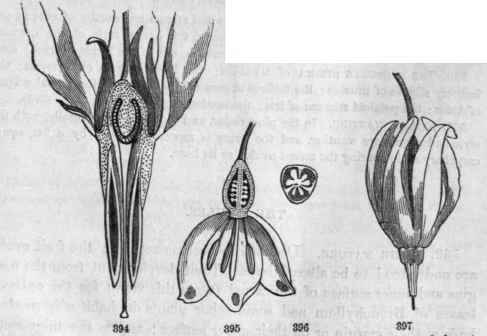 If this be compared with the pistil of the cherry seen in the figure (378, 379), no doubt can be entertained that the two sides of the leaf correspond to the walls of the ovary, the margins to the ventral suture, the midvein to the dorsal suture, and the lengthened apex to the stylo and stigma. Sometimes the flower contains two such leaves, which always present their faces toward each other. This corresponds to the position of the true carpels, in which the ventral sutures of both are contiguous. 519. The doctrine deduced Many other plants, as the rose, Anemone, Ranunculus, flowering almond, exhibit similar transformations of the pistil, making it probable that it is formed upon the same plan in all plants. The ovary, therefore, is the blade of a leaf, folded into a sack: the stylo is the length3ned apex folded into a tube; the stigma, a thickened and denuded portion of the upper margin of the leaf. 520. The placentae are usually prominent lines or ridges extending along the ventral suture within the cell of the ovary, and hearing the ovules. They are developed at each of the two edges of the carpellary leaf, and are consequently closely parallel when those edges are united, forming one double placenta in the cell of each ovary. 521. The simple carpel, with all its parts, is completely exemplified in the pea-pod. When this is laid open at the ventral suture, the leaf form becomes manifest, with the peas (ovules) arranged in an alternate order along each margin, so as to form but one row when the pod is closed. In the pod of columbine the ovules form two distinct rows: in the simple plum carpel each margin bears a single ovule, and in the one-ovuled cherry only one of the margins is fruitful. 522. The stigma is the glandular orifice of the ovary, communicating with it either directly or through the tubiform style. It is usually globular and terminal, often linear and lateral, but subject to great variations in form. It is sometimes double or halved, or 2-lobed, even when belonging to a single carpel or to a simple style, as in Linden, where these carpels are surmounted by three pairs of stigmas. 523. The compound pistil consists of the united circle of pistils, just as the monopetalous corolla consists of the united circle of petals. The union occurs in every degree, always commencing at the base of the ovary and proceeding upward. Thus in columbine we see the carpels (pistils) quite distinct; in early saxifrage cohering just at base; in pink as far as the top of the ovaries, with styles distinct; in evening primrose to the top of the styles, with stigmas distinct; and in Rhododendron the union is complete throughout. 3S7, Ovary (follicle) of Larkspur, composed of single carpellary leaf. 388, Ovaries of the Columbine, five, contiguous but distinct 389, Compound ovary of Hypericum, of carpels united below with distinct styles. 390, Ovary of another Hypericum of three carpels completely united. 391, Ovary of Flax; carpels five, united below, distinct above. 392, Dianthus (Pink). 393, Saxifraga. 524. To determine the number of carpels in a compound ovary is an important matter. It may be known, 1, by the number of styles; 2, by the number of free stigmas (remembering that these organs are liable to be halved, § 522); 8, by the lobes, angles, or seams of the ovary; 4, by the cells; 5, by the placenta. 1, The compound ovary will have as many cells as carpels. 2, The partitions between the cells, i. e., the dissepiments (dissepio, to separate) will each be double, will meet in the center, will be vertical and alternate with the stigmas. 3, The single carpel can have no true dissepiment. If any ever occur it is regarded as spurious, being a membranous expansion of the dorsal suture or the placentae, as in flax. 4, The placentae as well as the ventral suture will be axial, and the dorsal suture on the outer wall, opposite the stigmas. 1, There will be no dissepiment (unless spurious, as in the Cruciferae), and but one cell. 527. Intermediate conditions. Between the two conditions of axile (or central) and parietal placentae we find all degrees of transition, as illustrated in the different species of St. John'swort, and in poppy, where the inflected margins of the carpels carry the placentae inward well nigh to the axis. 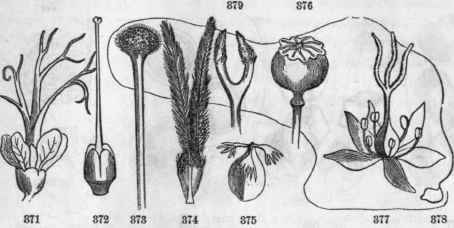 Moreover, the placentae are not always mere marginal lines but often wide spaces covering large portions of the walls of the cell, as in poppy, water-lily, and in other cases, as Datura, they become large and fleshy, nearly filling the cell. 397, Flower of Dodecatheon Meadia. 394, Vertical section showing the Tree central placenta. 395, Vertical section of Lueojum (Snow-flake). 396, Cross section of ovary. 528. A free axile placenta, without dissepiments, occurs in some compound, one-celled ovaries, as in the pink and primrose orders. This' anomaly is explained in two ways: first, by the obliteration of the early formed dissepiments, as is actually seen to occur in the pinks; secondly, by supposing the placenta to be, at least in some cases, an axial rather than a marginal growth; that is, to grow from the point of the axis rather than from the margin of the carpellary leaf, for in primrose no dissepiments ever appear. 398. Samolus Valerandi, section of flower showing the free axile placenta. 399, Ovary of Scrophulariaceae. 400, Ovary of Tulip. 401, Cross-section of ovary of Flax, 5-celled, falsely 10-celled. 402, Ovary of Violet, 1-celled. 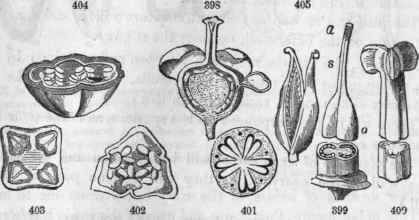 403, Ovary of Fuchsia, 4-celled. 404, Ovary of rock-rose, 1-celled, 5-carpelled. 405 Gentianaceae, 2-valved, 1-celled. 530. The globular stigma of Mirabilis; the linear stigma of Gyromia; the feathery stigma of grasses; the filiform stigma of Indian corn; the lateral stigma of Aster; the petaloid stigmas of Iris; the hooded stigma of violet (371 - 379). 531. Stigma wanting. In the pine, cedar, and the Coniferae generally, both the style and stigma are wanting, and the ovary is represented only by a flat, open, carpellary scale bearing the naked ovules at its base.